After our engagement in February of 2010, we knew that we wanted an August wedding. Planning a wedding in six months was definitely a challenge, both emotionally and financially, but we both agreed that planning the honeymoon was just as important as the wedding. We knew that, regardless of the cost of the wedding, we needed to find the means to have the honeymoon that we really wanted. We needed to make it happen somehow, that’s why Traveler’s Joy was perfect for us! 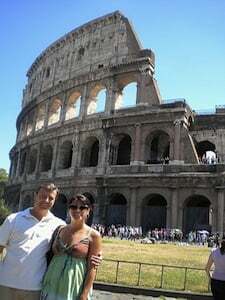 After one of my bridesmaids suggested using Traveler’s Joy, Jeff and I decided to register for our honeymoon to Italy, which included visits to Venice, Tuscany (Panzano) and Rome. I had been to Italy before but my husband had not. I knew it would be the perfect setting for a wonderful and romantic honeymoon. We weren’t sure how our family and friends would react to our honeymoon registry, but it turned out to be a huge hit. The website was extremely easy for everyone to navigate. We were able to choose from a variety of wonderful activities and could pick exactly the ones that we wanted to partake in. I knew that our trip to Italy was going to be special, and I loved that our guests were able to see the activities that we chose together. The website was so simple for our guests to use. We received many compliments on using such a creative registry and our guests were happy to know they were contributing to our honeymoon experience in a very special and unique way. Thanks to Traveler’s Joy, our guests helped to create memories that we would never forget. We started our romantic journey two days after we were married. On August 10, 2010, we arrived in Venice, Italy, and took a boat from Venice Airport to our hotel. We stayed at the Locanda Orseolo Hotel, which is located on the Orseolo Canal. Once we arrived in the canals of Venice, we knew that this would be a trip we would love. After all, we were in the most romantic city in the world! This was the home of Casanova! The view from our room at the Locanda Orselo overlooked the canal, where we could see everyone on the gondolas and listen to beautiful Italian music. We spent the following days touring Venice, drinking cappuccinos and having candlelit dinners at the Piazza San Marco. We visited the Peggy Guggenheim Museum, Basilica di San Marco, and experienced a fabulous gondola ride. We drank plenty of prosecco and saw a play called Venezia, which told the story of Venice and its racy history. From Venice, we took a scenic train ride to Florence, where we rented a car and began our road trip to Tuscany, heading to Villa Le Barone, which is located in Panzano in Chianti. The car ride was amazing! As we made our way to the villa, we passed many vineyards and castles, and traveled down lots of winding roads. The Villa Le Barone is run by a count and countess (Corso et Jacqueline Aloisi de Larderel) and located on their private vineyard. At Le Barone, we scheduled a three-hour private cooking class with a chef and made a three-course meal that we then enjoyed eating together. 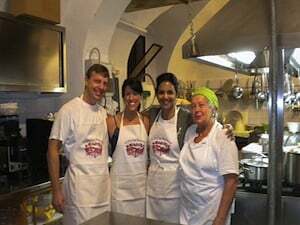 Because the chef only spoke Italian, we needed the help of an interpreter, but listening to the chef speak only in Italian made the experience authentic and so much fun. Each evening, we enjoyed the dinner prepared for us as we sat at a table that overlooked the vineyard. We are wine aficionados and so we absolutely loved spending four days in Tuscany and touring many vineyards in the Chianti region. We also took a daytrip to San Gimignano to see the medieval architecture and a trip to Siena where we saw the Piazza del Campo. Tuscany is truly a beautiful place and we really enjoyed the wineries and the scenery. It will be embedded in our minds forever. Then it was off to Rome, which was the last leg of our journey through Italy. We decided to drive from Tuscany, but when we arrived in Rome, on August 15, the city had been shut down. We learned that it was a holy day of obligation, The Assumption of Mary. Luckily, we were able to flag down a cab that took us to our hotel. When we arrived at the Domus International Hotel near the Spanish Steps, we were so excited to be in such a great location! Our hotel was very clean and modern and featured all of the necessities. We were thrilled to be in Rome and knew there was much to see. We started our exploration immediately with a “Night Tour” of the city. We proceeded to see the Pantheon, Trevi Fountain and had dinner in the Piazza Navona. We continued our tour the next day, seeing the Colossuem and the Forum. We walked everywhere, taking in all of the city’s sights, drinking prosecco, eating lots of pizza and having late night gelato on the Spanish Steps. We finished off our honeymoon with a trip to Vatican City. This was an exceptional day! Simply being inside the Sistine Chapel is something that we will never forget. Then, visiting St. Peter’s Basilica and the tombs of former popes was just amazing. 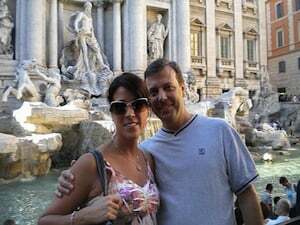 Rome was certainly our favorite spot as it was filled with history, amazing food and warm people. We had an incredible honeymoon and it would not have been possible without the help of Traveler’s Joy. I would highly recommend using this website and planning a honeymoon to Italy. Overall, this trip cost us $12,670 including airfare. We came home with memories that will last a lifetime, and over 1000 pictures to let us relive our honeymoon whenever we want! Thank you, Traveler’s Joy, for making our dream honeymoon possible.